Orange County Veterans Deserve a Final Resting Place. The ARDA is the Only Site that has a Real Chance of Receiving the Necessary Funding. Let’s Get it Done! I have been fighting for a veterans cemetery on the hallowed grounds of the former El Toro Marine Air Station for many years, beginning in 2013. On March 11, 2014, I cheered when the City Council unanimously voted to designate the Amended and Restated Development Agreement [ARDA] site in the Orange County Great Park in Irvine as the future site of a verterans cemetery. But when I became an Irvine City Councilmember in 2016, I learned that there had been no progress on a veterans cemetery in the intervening two years because, I was informed, of the high cost of the decontamination and demolition necessary on the originally designated ARDA site. Because the ARDA site did not appear to be financially viable, I, along with the Orange County Veteran’s Memorial Park Foundation and many national and local veterans organizations, supported the Strawberry Fields site as a less expensive, more practical, and faster alternative. When the voters rejected the Strawberry Fields site as causing too much traffic and being too close to the freeway, I then proposed, along with Irvine City Councilmember Christina Shea, using a portion of the Orange County Great Park (and the former MCAS El Toro) that is currently planned for a golf course to be used instead for a veterans cemetery. Subsequently, a site was proposed in Anaheim Hills near the 91 Freeway. While I am not opposed to that site, the fact is that it has not received support from the Assembly, has not received any financial backing from either the county, state, or federal government, and is not located on the historically appropriate grounds of the former MCAS El Toro. It does not appear to be viable. Now several of our state legislators have recently indicated a strong preference for the ARDA site originally designated by the Irvine City Council. Significantly, several members of the legislature, from both sides of the aisle — Democrats Senator Thomas J. Umberg (SD 34) and Assemblymembers Sharon Quirk-Silva (AD 65) and Tom Daily (AD 69) and Republican Assemblymembers Tyler Diep (AD 72), William Brough (AD 73) and Philip Chen (AD 55) — have pledged to allocate the funds necessary for the decontamination of the site and the construction of a veterans cemetery in that location and urged the Irvine City City to re-designate it as the official site. This week, on April 9, 2019, Assembly Bill 368 was unanimously approved (10-0) for passage by the Assembly Veterans Affairs Committee and referred to the Appropriations Committee. Accordingly, it is now clear that the only site that has a real chance of receiving the necessary funding for an Orange County veterans cemetery is the ARDA site. For this reason, I am withdrawing my support for the golf course site option and joining with these state legislators in calling for the Irvine City Council to again designate the ARDA as the site for a veterans cemetery and calling on the state and federal government to provide the funding needed to build a veterans cemetery on the ARDA site in the Great Park on the hallowed grounds of the former El Toro Marine Station. Further, this month, United States Representative Gilbert Cisneros (CA 39), a retired naval officer and a member of the Congressional Subcommittee on Military Construction, Veterans Affairs and Related Agencies has urged the federal government to step up and provide financial help for our long-overdue veterans cemetery in Orange County. Along with the Orange County Veterans Memorial Park Foundation, which has led the fight years-long fight for an Orange County veterans cemetery, I say “Hurrah!” to Rep. Cisneros’ letter. Based on all these factors, as a member of the Irvine City Council and the daughter of a combat veteran, I hereby fully commit to the goal of building a Southern California Veterans Cemetery on the grounds of the former MCAS El Toro at the ARDA site. I have never approached this issue from a partisan perspective, or with concern for anything but properly honoring O.C. veterans like my father. My sole concern now — as it has been from the beginning of this effort — is doing whatever I can to ensure that an O.C. Veterans Cemetery becomes a reality. I look forward to working in a positive, bipartisan way with our state and federal representatives, other Irvine City Councilmembers, the Orange County Veterans Memorial Park Foundation, veterans organizations, community groups, and private donors, doing whatever it takes and pulling together in the same direction, to finally establish the Orange County veterans cemetery that we have fought for and needed for so long. Our veterans deserve a final resting place close to their families and loved ones. Message from General Robin Umberg: Vote Yes on Measure B! Here is a message I recently received from my friend Brig. Gen. (ret) Robin Umberg urging us to vote Yes on Measure B. As a soldier for 36 years and an Army Brigadier General (ret), I know that the women and men I have served with are the bravest and most devoted people I have ever met. They were all willing to make the ultimate sacrifice for our country and deserve to be honored and remembered within a sacred military cemetery. Passing Measure B is the only way that veterans will get the cemetery in Orange County that they deserve. That’s why I’m writing to you today — to make sure that you and your friends are prepared to vote Yes on Measure B. Here are the facts: It has been endorsed by the American Legion, Veterans of Foreign Wars, and both Republican and Democratic Parties of Orange County. Think about that. A Yes on Measure B will cost citizens less, achieve the mission of constructing the cemetery in the quickest time frame, and this change of site will not increase Orange County’s traffic. It will ensure the establishment of a gorgeous cemetery that will be visible from two highways. We are closer than we have ever been to providing this much-needed space for remembering our veterans. We can’t let them down now — please vote Yes on Measure B by J‌une 5‌th. Thank you for honoring our veterans. Distinguished Environmental Group Laguna Greenbelt Endorses YES on Measure B for Veterans Cemetery! The Strawberry Fields Site is the Best Location for the Veterans Cemetery. Now Let’s Get it Done! Don’t Be Deceived By The “Save The Veterans Cemetery” Petition! Help Us Defeat the Paid Mercenaries who have Invaded Irvine and their Fraudulent “Save the Veterans Cemetery” Petition! As the daughter of an Orange County Korean War combat veteran, I am proud to have participated in making sure that Orange County’s veterans – who have sacrificed so much for us – will at last have a final resting place close to their families and loved ones. Please help by voting YES on Measure B. Celebrate Armed Forces Day — Vote YES on Measure B! Today, May 19, 2018, is Armed Forces Day. First observed in May 1950, the day was created to honor Americans serving in the five U.S. military branches – the U.S. Army, U.S. Navy, U.S. Marine Corps, U.S. Air Force and U.S. Coast Guard – following the consolidation of the military services in the U.S. Department of Defense. To all active duty, reserve and veteran members of the U.S. armed forces – thank you for your service to our nation! Orange County has a long and proud military tradition. Currently, more than two million veterans live in California – more than in any other state. Orange County has over 130,000 veterans — one of the highest populations in the United States – including more than 7,000 veterans of the Iraq and Afghanistan wars. Yet Orange County veterans do not have their own dedicated military cemetery. Those in Orange County who want to visit a veteran’s grave in a military cemetery must travel several hours to Riverside, San Diego, or Los Angeles counties. Please join me in showing your support for Orange County’s military veterans by voting YES on Measure B to facilitate the creation of a veterans cemetery on the grounds of the former El Toro Marine Base. Orange County veterans – who have sacrificed so much for us – deserve a final resting place close to their families and loved ones. The leaders of the distinguished environmental group Laguna Greenbelt recently issued a strong statement urging voters to support Yes on Irvine’s Measure B in order to facilitate the creation of a veterans cemetery on the site known as the strawberry fields. Laguna Greenbelt is a grassroots organization that has worked ceaselessly to protect wildlife habitat in Orange County since 1968. Over the last fifty years, it has led efforts to preserve a coastal wilderness area that is now 22,000 beautiful acres. Today Laguna Greenbelt continues to defend this iconic landscape for the sake of its wild inhabitants and the people who love it. The Measure B Strawberry Fields Veterans Cemetery site is bisected by the lower part of the “Central Reach” of the Nature Greenbelt, which is crucial to preserving our environmental heritage. One of Laguna Greenbelt’s major projects has been the creation of an essential nature corridor across Irvine to connect the coastal wildlife habitat west of the I-5, to the much larger open space of the Santa Ana Mountains, including the Cleveland National Forest. Last March, I had the opportunity to join Laguna Greenbelt President Elisabeth Brown, Ph.D, along with Irvine Mayor Donald P. Wagner and Councilwoman Christina Shea at the groundbreaking ceremony for the Orange County Great Park Wildlife Corridor. As envisioned by Laguna Greenbelt, this nature corridor will link our coastal wilderness with the Santa Ana Mountains/Cleveland National Forest and will ensure the health and future of wildlife and their habitat in our region’s 22,000 acres of coastal parks. “Last September, the City of Irvine agreed to a land swap with developer Five Point Communities. This moved the cemetery site to land near the Spectrum V development and the I-5/I-405 interchange. The gently sloping new site is currently being used as agricultural land to grow strawberries. In exchange, the city deeded over the parcel along Irvine Blvd, where the cemetery was originally planned. After the land swap was completed, the City deeded the new site to the State of California, which is responsible for building the cemetery. There is now controversy over whether the land swap is in the best interest of the City of Irvine. Political squabbles aside, Laguna Greenbelt, Inc., would like the public to consider the land swap’s merits through the lens of land use principles, open space preservation, and wildlife movement. Representatives of Laguna Greenbelt, FivePoint, and the City of Irvine at the groudbreaking for the Great Park Nature Corridor in March 2018. Our grassroots organization has been working with the City of Irvine since before 2000, and since 2012 also with the developer Five Point Communities, to design and complete an essential wildlife corridor across Irvine to connect coastal wildlife habitat west of the I-5, to the much larger open space of the Santa Ana Mountains (including Cleveland National Forest). This wildlife corridor, that we have come to call the Coast to Cleveland Wildlife Corridor, is currently taking shape on the only possible route that will ensure that the coastal wild lands, including Shady and Bommer Canyons, and several other parks and preserves, will not wither and die over time (ecologically speaking), throwing away hundreds of millions of dollars that the community has invested over the many decades it took to set aside and manage our parks and preserves. In mid-March, as a community, we celebrated the groundbreaking of the last stretch of the wildlife corridor between the Santa Ana Mountains and the coastal open space. In short, it’s a dating corridor for wildlife, at a time when they are increasingly isolated from one another by multi-lane roadways and urban development. The event was important; the corridor is about 6 miles long, and the stretch under construction will be almost half of that, as it crosses Irvine between Irvine Blvd and the I-5. The so-called Great Park stretch will be entirely on the former Base, but not near the park. Instead, it will be adjacent to future urban development around the park on the East side, and, depending on the June fifth vote, it might meet the Veterans Cemetery. When considering land uses that will be neighbors of habitat and wildlife corridors, it’s clear that some are better than others. Animals exploring for food, cover, and water are spooked and avoid moving towards noisy areas with human activity, lights, cars, unfamiliar smells, and domestic pets. Land uses that are quiet at night and minimize human activity near a wildlife corridor are favorable for animals moving through the area, allowing them to continue on their journeys. In general, a cemetery is one of the best complementary land uses for natural areas and wildlife; a dark and quiet place at night, when many animals are active. However, in real estate, it’s all about the location, and one of the sites proposed for the Veterans Cemetery is much better than the other for animals traveling along the corridor. A cemetery built on the strawberry-growing site would be bisected by the wildlife corridor, greatly increasing the amount of green space available to the animals. The lush greenery of the cemetery would help support wildlife to feed and mingle before moving on. In contrast, the original cemetery site on Irvine Blvd is not near the wildlife corridor, and would have no benefits for wildlife movement or encouraging genetic mixing. Animals moving downslope from the mountains that found their way to the cemetery across busy Irvine Blvd would be blocked from moving safely inland or seaward. Surrounded by urban development and Irvine Blvd on all sides, the cemetery would be just another isolated fragment of open space. Learn more about the Coast to Cleveland Corridor here. You can watch a video on the Great Park Nature Corridor here. Elisabeth M. Brown, PhD is a biologist and the president of Laguna Greenbelt, Inc. She has resided in Orange County for 51 years. Elisabeth’s involvement in managing local wildlands has included founding roles in the Nature Reserve of OC and the Coastal Greenbelt Authority. Gabriela Worrel is the outreach coordinator at Laguna Greenbelt, Inc and a freelance writer. She is a Southern California native currently living in Los Angeles, and holds degrees in biology (Westmont College) and urban planning (UC Irvine). Vote YES on Measure B on June 5 for an OC Veterans Cemetery! Please help by voting YES on Measure B! My family has a long history of service. My father sacrificed his hearing flying combat missions over North Korea as a bombardier and crew chief. We lost his cousin in combat at Inchon. All of my uncles served in the Marine Corps. My grandfathers and my father-in-law served in WWII in the Navy. There are many more. I respect and honor our military tradition and I serve the residents of Irvine. I was one of the earliest and strongest advocates for a Veterans Cemetery located at the old El Toro Marine Air Station. I attended and spoke at every Irvine City Council meeting where the Veterans Cemetery was discussed. My strong commitment to an Orange County Veterans Cemetery located on the grounds of the old El Toro Marine base in Irvine has never wavered. My goal always was, and remains, to establish this cemetery as expeditiously as possible. The choice is now yours. A “YES” vote on Measure B means there will be a veterans cemetery. By voting YES on Measure B on June 5th, we can break ground on the Orange County veterans cemetery immediately — a location that has already been approved by local, state, and federal governments. A “no” vote means the promise will be broken. The necessary decontamination of the original site is far too expensive (more than $77 million) for the state or city to undertake. Moreover, if Measure B fails, the original site will not remain as a contaminated junk yard, but instead will no doubt be sold or leased to a developer willing to invest in the extreme costs of a massive cleanup. Both sites will then end up being used for more commercial buildings and residential development. I campaigned on the promises to ensure a veterans cemetery on the old El Toro Marine Base and to safeguard taxpayers’ dollars, as well as to reign in runaway development. The land exchange — Measure B — allows me to keep each of these promises. The June 5 vote is NOT an “either/or” vote on the location of a veterans cemetery, but rather a “yes/no” vote on whether there will ever be a veterans cemetery at the former El Toro Marine Base. This is not – and should not be – a partisan or divisive issue. It is a commonsense matter that we can all get behind to respect and honor our veterans. I campaigned on the promises to ensure a veterans cemetery on the old El Toro Marine Base, reduce traffic congestion, and safeguard taxpayers’ dollars, The land exchange — Measure B — allows me to keep each of these promises. Let’s do what’s best for veterans and for the residents of Irvine. Vote YES on Measure B on June 5! The OC Weekly just published another story about my continuing fight for a veterans cemetery in Irvine. 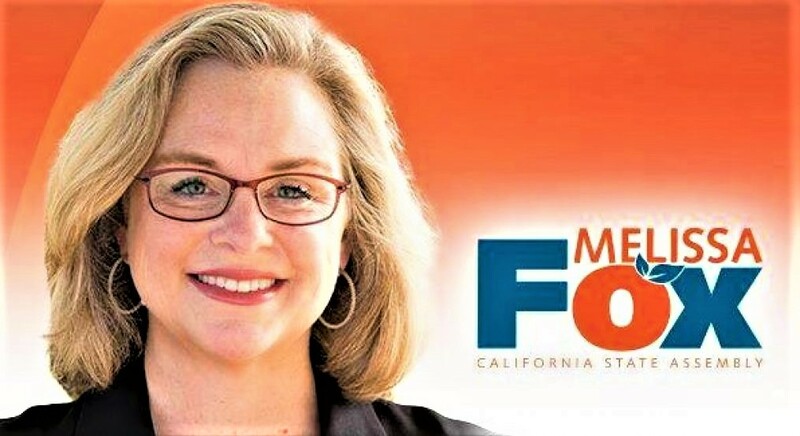 “Nine days after being named Best Politician in OC Weekly’s massive Best of 2017 issue, Irvine City Councilwoman Melissa Fox was hit by a dude. Coincidence? Yes and no. Raul Ricardo Rodriguez-Peltz of Westminster, Colorado, probably has never heard of your favorite infernal rag. However, the 28-year-old’s Oct. 29 booking into Irvine City Jail on misdemeanor assault does stem from the same stand Fox took that earned mad respect from OC Weekly’s Best of 2017 Board of Governors. Fox was part of a City Council majority that approved placing the state-run memorial park in what are now strawberry fields but used to be part of the former Marine Corps Air Station El Toro. In exchange, the current land owner gets property within the nearby Great Park that is currently contaminated [note: the property that the develop gets from the City, like the property that the City gets from the developer, is not within the borders of the Great Park; both properties are adjacent to the Great Park, and — most importantly — both properties were part of the former El Toro Marine Base, which was closed in 1999]. But Agran is not one to lose a fight without going down in another fight. He and the infernal rag in his back pocket—not us, silly; the Irvine Community News and Views—continued to lobby for “The Great Pork” to host the vet cemetery, and a local “Save the Veterans Cemetery” campaign was soon launched. Backers had until our day of publication (Nov. 9) to submit around 12,000 valid signatures from registered voters in the city to get a referendum on the November 2018 ballot affirming or denying the council’s decision. Fox says residents complained to her about signature gathers being aggressive, so she snapped photos of them (that you can see on melissafoxblog.com). She told police that led to a confrontation in which Rodriguez-Peltz grabbed a sign she had stating, “Do not sign the misleading veterans cemetery petition. Get the facts”; swung it at her; hit her leg with it; then tore it up and threw it in the trash. The following letter was written to Larry Agran and his followers about their petition regarding the veterans cemetery by former Irvine Company Executive Mike Padian. Padian worked for the Irvine Company between 1985 and 1996 and has first-hand knowledge of the politics and personalities involved in the current dispute. His views are well worth reading for anyone interested in the facts about the veterans cemetery. Oh dear, where to begin. I have read your numerous diatribes; I hope you will give me some courtesy by reading the below. I am primarily responding to Harvey’s email of 11-2, and an accompanying ‘fact sheet’. I will attempt to not repeat myself. 1) Yes, the entire ARDA site would be cleaned up with the land-clearing process. However, the ARDA site is significantly more polluted than the Freeway site, and the use of the ARDA site for commercial/industrial purposes would be less costly to develop and have less impact than a residential or a cemetery use. To determine the potential risk of exposure from a hazardous site requires an analysis of the location, type, and concentration of the hazardous materials, the potential sensitive receptors (people), and the potential pathways between them. The ARDA site contains a ‘witches’ brew’ of above ground, surface, and below ground known and probably unknown chemicals, in known and probably unknown concentrations, quantities and locations. At the time of the Base’s closure, it was one of the larger federal Superfund sites. As noted in CalVets June 2016 report, FOST 7, a source of regional groundwater contamination, is located on the ARDA site. FOST 8 (IRP 3), a former landfill dump site, is also located on the ARDA property. The June 2016 report also states that many of the 77 buildings on the site contain hazardous material such as asbestos and lead-based paint, numerous documented impacts on the site have been discovered, and very probably other impacts will be discovered during development. Regardless of the ultimate land use, the buildings will have to be appropriately abated and abolished, but the extent of surface and subsurface mitigation is dependent on the ultimate use. The 2016 report estimated $3.5 million for hazardous wastes, $2.5 million for the site demolition of the first 12.5 acres ($200,000 per acre), $6.2 million for the remaining 112.5 acres ($55,000 per acre, no reason is given for why the 112.5 acres costs less per acre than the initial 12.5 acres), and $18 million for building demolition, for a total of $30 million. Note that the 2016 report repeatedly recommends additional soils surveys to identify any impacted soil, and to define its appropriate mitigation. Also note the 2016 estimates do not include any costs for the remediation of contaminated soils, and assumes the State of California will pay for those costs. Residents are one of the higher potential risk receptors on the site due to their potential rate of exposure, 14-24 hours every day, with an expectation that they could enjoy their outside yards, patios, and parks; their pathways could be reduced with the removal of substantial amounts of soil, and the capping of large areas with hard surfaces. Cemetery workers would also be a higher risk group, as they would be directly exposed to the contaminated soils during excavation for interments; thus, the reason for the 2016 report’s recommendation to overex the entire site 8′ to 10′. Commercial/Industrial development will require the least amount of soil remediation, and their employees and clients are the least potentially impacted receptors, because most will be inside an enclosed building for 8 hours a workday, on a site with significant hardscape and parking. I am currently paying about $40/cy to export non-hazardous material to a local landfill or another construction site a maximum of 30 miles away utilizing a large 7cy bucket excavator and associated dozers, blades, and water trucks, and I am paying about $20/cy to import clean material, both via 14cy double-belly dumps. If the materials are heavily contaminated the export rates would be significantly higher because they would have to be taken to a licensed hazardous material landfill in north LA County or Banning, using smaller capacity end-dumps. Worst case, 10′ over 125 acres equals 2,000,000 cy of material. To accomplish the complete export of all 2,000,000cy would require 575 one-way truck trips per day for a year (250 work days). Total export truck trips would result in 1,150 truck trips per day. To match the export rate, the import rate would have to be equal to the 1,150 truck trips per day, for a total of 2,300 truck trips per day, or 280 truck trips per hour, or almost 5 trucks per minute for 250 days. The cost to export and import 2,000,000 cy would cost $120 million, and again definitely higher if it had to be exported to a licensed hi-hazard landfill. This is somewhat of a linear equation, that is, if only 1,000,000 cy of material had to be exported and imported, the total cost and total truck trips would be cut in half. However, it is not a question of if the ARDA site has soil contamination, it is a question of how much. Regardless, I am sure the existing residents would not be agreeable to any large quantity of hazardous material hauling trucks rumbling along Sand Canyon and Portola. The Freeway site, on the other hand, has no buildings, is not the site of any groundwater or landfill contamination sources, and does not contain the ARDA site’s ‘witches’ brew’. Instead, the Freeway site has been exposed to only known, controlled amounts of pesticides, herbicides, and fertilizers, which do not require extensive mitigation. 2) The proposed Freeway site was part of the Federally-owned El Toro Base, as an extension of the approach and take-off runways. The Base, as you know, was used for training aircraft carrier pilots, among others. One of their procedures was the Field Mirror Landing Practice, where they performed ‘touch and go’ landing/takeoff maneuvers. Before the area was developed, the jets flew almost wherever they wanted. Once the Irvine Company started developing the areas around the Base, the Company and the Marines agreed to land and air restrictions and easements. The Freeway site was part of the runway extension. It was not fenced off because it was not considered a security risk. It was however, considered a ‘crash’ zone. The reason the tall buildings in Irvine Spectrum, the Irvine Hospital, the low-profile buildings in Irvine Spectrums 3 & 5, and the old diagonal limit to the residential Northwood area to the west of Jeffrey are where they are, are due to these easements. In essence, the Company agreed to not allow any residential in the FLMP flight path outside of the runway extension ‘crash’ zones owned by the government, and to limit commercial/industrial within the FLMP flight path outside of the ‘crash’ zones, in an effort to limit the Marines potential risk based on an assumption that a fueled aircraft crash would wipe out basically an acre. The ARDA is adjacent to, but was never part of a formal public “Great Park”. No one has ever claimed that the Freeway site is part of the public recreational “Great Park”. The Freeway site is as much of the overall Great Park development as the adjoining Broadcom property (which was part of the aforementioned FLMP zone). 4) The $30 million was never officially approved. It was part of a proposed budget, but was withdrawn once the potential total costs, especially the extra costs for the pollution mitigation, of the ARDA were determined. In addition, the federal government, in their review of the pre-grant application, would contribute only $10 million out of $30 million requested, leaving a significant funding shortfall. On the other hand, the State has approved $500,000 for design, and $5 million for construction of the Freeway site. Five Point has pledged an additional $10 million. CalVet is proceeding with the Freeway site design, and is currently reviewing the qualifications of three design firms. 5) Admittedly, I do not know the President of the Chinese Cultural Association. However, I know that he does not represent all of the residents in the City, nor all in the Great Park neighborhoods in particular. One only has to look at the contentious public hearings (some theoretically only for Asian residents) and the statements of various City Council and Mayoral candidates to ascertain the depth of the residents’ concerns. 6) Yes, the ARDA site will have to be decontaminated. However, because it is such a polluted site, the impact to the taxpaying public – national, state, and local – would be significantly less if that substantial cost was incurred by a developer. The general public will be better served by developing the less-polluted, less costly, Freeway site instead. 7) All of the major veteran cemeteries in Southern California – Los Angeles, Riverside, and Miramar – are adjacent to a freeway. The Freeway site clearly presents visible exposure to more people than a cemetery hidden in the middle of a residential area. 8) Location, location, location. Adjacency to a freeway significantly increases the value of a piece of property. as compared to parcels that are remote from a freeway. Another major developer has purposely retained ownership of large swaths of freeway adjacent property because of its long-term value. 9) The City’s own traffic report, as approved by the Transportation Commission, concluded that the land swap has no impact to the City’s traffic. I could go into why this is, but will summarize by saying the ‘cat was out of the bag’ decades ago when the entitlement for the entire City was approved. For instance, the primary reason that the Airport area is seeing such an increase in traffic is due to a previous Mayor’s vision (Larry Agran) of converting the area from industrial to a more urban, high density commercial/residential community. The buildout of the Airport area is not complete. Unfortunately his dream of creating places for people to live walkably closer to their work for the most part has not materialized. The area is not highly urbanized like Chicago or New York City, there will not be a mass-transit system that will work for a long time, and the only solution, unfortunately, is wider roads to accommodate the continued demand for personal vehicular transportation, and more congested traffic. 10) Construction of a veterans cemetery has not been delayed. The previous submittals and approvals are being revised for the Freeway site. And as noted above, CalVet is proceeding with the design. The Freeway site can be developed much quicker because it does not have to endure the lengthy hazardous material mitigation period. 11) Admittedly, the Freeway site would be a great commercial/industrial site. However, after weighing all of the factors, the Freeway site would also be a great location for a Veteran’s Cemetery. 12) 21-gun salutes at the Freeway site may have some impact to the existing wildlife, who are used to living in a deteriorating agricultural ditch surrounded by roads and industrial development, but less than 21-gun salutes in a neighborhood full of residents and schools. Also, the term ‘wildlife corridor” is not limited to birds and mammals; the intent is to provide habitat and connectivity for all types of living organisms, including plants, insects, amphibians, and reptiles. In addition to the above, you have never mentioned the following facts. 1) The ARDA site has the support of only two local elected officials. The Freeway site on the other hand has wide bi-partisan support of elected national, state, county, and local officials, including members of Congress, the Governor, members of the State legislature, County officials, the Mayor, and other Council members. 2) The SOVC [Larry Agran’s phoney “Save the Veterans Cemetery” group] is not a grass-roots organization. There is no great out-pouring of concern from the residents. Rather it is a trumped up, blatant attempt to thwart the efforts of the developer, by playing up a minority nimby ‘development is out-of-control’ sentiment. One of the primary SOVC proponents is the Irvine World News and Views, a political mailer, run by an owner who is not local. The issues being raised by the SOVC have nothing to do with a veterans cemetery, and they are using the veterans for political reasons.The primary reason there is substantial public Great Park elements at all – including the soccer stadium, concert venue, and streets – is due in large part to the developer’s funding and construction involvement. The SOVC has resorted to using paid predatory out-of-state non-veterans, who you admit have no stake in or knowledge of the issues, to collect signatures based on misleading and false representations. Calling your signature gatherers ‘mercenaries’ is at least truthful. 3) The SOVC continues to violate state and federal laws by utilizing the logos of and implying it has the support of the American Legion and the Veterans of Foreign Wars. As far as I know, the SOVC has not responded to the American Legion’s ‘cease and desist’ request. 4) You also insinuate that Council member Fox and veteran Bill Cook will receive some massive return for their participation. Such an insinuation is shameful and unfounded. 5) Last, labeling the groundbreaking as a sham is also shameful, and disrespectful of the hundreds of veterans, concerned citizens, and elected officials who attended the event. No one has ever claimed the Freeway site is part of the public recreational Great Park, as opposed to the SOVC who claims the ARDA site is within the recreational public ‘Great Park’. Bottom line, which is a more fitting site to honor those who sacrificed their time and lives to maintain your privilege to live in a free country – an unfunded, polluted, more expensive, hidden, and unapproved property, or one that is funded, not-polluted, less expensive, visible, and approved. You are doing such a disservice to the nation, the state, and the local community. Please stop wasting taxpayer time and money by stopping your petition efforts. I would be glad to review the real facts, not your alternate ones, at any time. Irvine Shares the Way: Improving the Safety of Everyone in Irvine, Whether Walking, Bicycling, or Driving. Sparky the Fire Dog’s Earth Smarts for Earth Day! I’m Attending the 2019 Housing California Conference as Chair of the Irvine Community Land Trust, Working with Experts, Legislators, and Community Advocates to find Practical Solutions to California’s Housing and Homelessness Crisis. Irvine Community Services Commissioner Melissa Fox speaks to City Council on behalf of OC veterans, urging the City Council to set aside land as a final resting place for Orange County veterans. Irvine Commissioner Melissa Fox welcomes Orange County Blues Football Club to Irvine! Sparky the Fire Dog's Earth Smarts for Earth Day! Making Affordable Housing a Reality: My Remarkable Year with the Irvine Community Land Trust! Orange County Veterans Deserve a Final Resting Place. The ARDA is the Only Site that has a Real Chance of Receiving the Necessary Funding. Let's Get it Done!